A slice of rich, delicious pound cake is high on my list of favorite desserts. Pound cake is easy to make, plus it's a nice change of pace from all of those frosting-laden baked goods. All the better to appreciate the dense texture, tender crumb and wonderful flavor of the cake itself. Don't get me wrong; I love frosting, too. But now and then, I like my desserts unadorned. Have you ever wondered how pound cake came by its name? I always thought it referred to the weight; they seem to weigh a ton sometimes. In reality, the name came from old recipes that called for a pound each of butter, sugar, flour and eggs. That must have been some cake. The butter, sugar and eggs had to be creamed until they were perfectly smooth, light, and fluffy so the beaten eggs would leaven the cake. Now we have electric mixers and baking powder, but you still should cream the butter and sugar for several minutes until it feels smooth between your fingers. My first pound cake recipe is pretty close to one that my Aunt Flossie used to make. (Flossie was her nickname, but her real first name was Florence.) When it came to cooking, no one in the family could come close to her. I always looked forward to Christmas Day, when the extended family gathered at her house for dinner. My mom and my Aunt Ann weren't allowed to bring anything, but they pitched in to wash up afterward (while the male family members were all lounging around, groaning with overfilled bellies). Aunt Flossie, like many experienced cooks, did not rely on recipes. With a practiced eye, she estimated the amounts, which made it difficult for me to find something similar. I miss you, Aunt Flossie. Hope this comes close to your wonderful pound cake. This old-fashioned cake is great by itself or when served with fruit or a hot dessert sauce. Our photograph of the cake was with fresh Texas blackberries, a strawberry and whipped cream. If you don't have buttermilk on hand, use 1 tablespoon lemon juice and enough milk to equal 1 cup. Let it stand 5 minutes before you use it. Preheat the oven to 350°F. Grease and flour a 12-cup Bundt or 10-inch tube pan, tapping it to release the excess flour. Set aside. Dissolve the baking soda in the buttermilk and set aside. Whisk the flour and salt together in a medium-size mixing bowl and set aside. With an electric mixer, cream butter and shortening together in a large mixing bowl until very light and fluffy, about 4 minutes. Gradually add sugar and beat until light and fluffy. Add the eggs, one at a time, beating well after adding each one. Gradually add the flour mixture, alternating with the buttermilk mixture, beginning and ending with the flour. Beat well after each addition. Stir in extracts by hand. Pour batter into the prepared pan. Bake until a toothpick inserted near the center comes out clean (about 1 hour and 15 minutes). Let cool in pan on a wire rack for 15 minutes. Invert cake onto the rack and cool completely. Transfer to a serving plate. Add a topping or serve with a dessert sauce, if desired. Makes 12 servings. If I'd known you were coming, I'd have baked a cake. 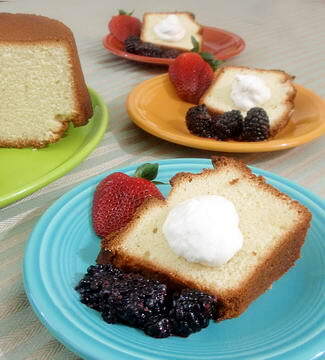 You'll love this next pound cake. It's great plain, but you can top it with a glaze if you really want to. For me, it's just fine as is, but I've included the glaze recipe just in case. Caution: Do not open the oven door during the first hour of baking. Preheat oven to 350°F. Grease a 10-inch tube pan. Sprinkle with ground pecans, coating the bottom and sides of pan. In a large bowl, beat together the butter, cream cheese, brown sugar and sugar until light and fluffy. Add eggs one at a time, beating well after each addition. In a small bowl, combine the flour, baking powder and salt. Mix well. Add vanilla and maple extracts to the milk. Add the flour mixture to the butter mixture alternately with milk, beginning and ending with the flour mixture. Fold in pecans. Pour batter into greased and coated pan. Bake for 65 to 80 minutes or until toothpick inserted in the center comes out clean. Cool upright in pan for 10 minutes, then invert onto a cooling rack. Cool completely. In a small saucepan, melt the butter with the brown sugar. Bring to a boil. Boil until thickened, stirring constantly. Remove from heat and stir in remaining glaze ingredients. Add enough water to achieve the desired consistency. Spoon glaze over cake. Makes 16 to 20 servings. Next is a cake that I've heard described as chocolate heaven. A bit of advice: Even if you're using a nonstick baking pan, grease and flour (for this cake, use cocoa) to keep crumbs or bits of cake from sticking. It makes cleanup easier, too. This yummy cake is so rich that it needs no glaze, but you might shake a little powdered sugar on top, or serve with whipped cream. Preheat oven to 325°F. Grease a 10-inch square or round tube pan or a 12-cup fluted baking pan (such as a Bundt). Dust with cocoa (to avoid a white coating on the baked cake). In a food processor with knife blade attached, pulse the hazelnuts with 1/2 cup of the sugar until nuts are very finely ground. Occasionally, stop the processor and scrape the sides with a rubber spatula. Transfer nut mixture to a medium-size bowl and stir in the flour, cocoa, salt, baking powder and baking soda. Set aside. In a large bowl with mixer at low speed, beat the butter with the remaining 2 cups sugar until blended, scraping sides of the bowl often. Increase speed to medium-high. Beat until creamy (about 3 minutes), occasionally scraping bowl. Reduce speed to low. Add eggs one at a time, beating well after each addition. Beat in vanilla. Alternately add flour mixture and buttermilk, beginning and ending with flour mixture. Beat just until smooth. Spoon batter into prepared pan and spread evenly. Bake 1 hour and 15 minutes or until toothpick inserted in the center of the cake comes out clean. Cool cake in pan on wire rack for 15 minutes. For a tube pan, use a small metal spatula or knife with a thin blade to loosen the cake from sides and center tube of the pan. Invert cake onto a cake plate, then immediately invert again (the top side will be up) onto a wire rack to cool completely. For a fluted pan, invert cake directly onto wire rack to cool completely. Sprinkle with confectioners' sugar and serve with whipped cream, if desired. Makes 24 servings.